It was a powerful, wildly successful show, with unprecedented sales and community support, yet Jim McVicker described his recent exhibit at the Cody-Pettit Gallery as a roller coaster of emotion. "The response to the show was completely amazing, but the whole week was a blur," he said. "Nothing felt real because Terry wasn't there." Jim gives his wife and painting partner, Terry Oats, credit for the inspiration behind the show, a retrospective "studio sale" featuring work he created from 1980 through 1999. "We were cleaning out our basement and I started pulling out painting after painting," said Jim. "I came up with the idea of having a studio sale, but when we saw how much good work was in storage, we knew it would be impossible to have it at our house. It was Terry who suggested the Cody-Pettit." Realizing the exhibit could be a major event, both Terry and Jim planned to help hang the paintings and remain in the gallery throughout the four-day event, but on the Monday before the show disaster struck: Terry fell off their roof while trimming a rhododendron. "It was horrifying," Jim recalled. "I heard her scream and my heart just stopped." The day after the accident, I visited Terry in the hospital and found her in high spirits, looking as radiant as ever. She apologized for not being able to help hang Jim's paintings, and said that although the X-rays had revealed a broken pelvis, she was convinced she would make it to Arts Alive! Saturday night. "Forget about the show," I instructed. "Just concentrate on healing." On Wednesday morning, Jim delivered his paintings -- 89 of them -- to the gallery, where there was already a crowd of potential collectors awaiting his arrival. I helped Jim and my husband Bill Cody (who co-owns the gallery with Bruce Pettit) unload the van, while Jim updated us on Terry's condition. Her caregivers were coping with "pain issues," he explained. They suspected her injuries might be more extensive than the X-rays had initially revealed. A CAT Scan was being scheduled, as well as an MRI. The two sleepless nights Jim had spent since the accident were etched in his face. I suggested he return to the hospital, but he said Terry had insisted he remain at the gallery. It would turn out to be a very long day, and the beginning of an even longer week. An immensely popular painter who hasn't had a public studio sale since 1983, Jim brought people to the gallery in droves. Four paintings sold before we had finished unloading the van. More people arrived and more paintings sold. In between conversations and sales, we hung the paintings, putting images of Yosemite from the '80s and '90s together, then grouping the artist portraits that Jim had created for a 1992 show at the Humboldt Cultural Center. We hung street scenes from the early '80s on one wall and ones Jim did when he was painting with George Van Hook back when they were sharing that "very funky" studio in Arcata on another. "There was no hot water, no shower, just a toilet. Rats running around, the whole thing," Jim recalled. He remembers being happy, though. "We were outside all the time anyway, painting on the streets." Jim's paintings revealed a variety of changes in the region since he began painting here, 35 years ago. 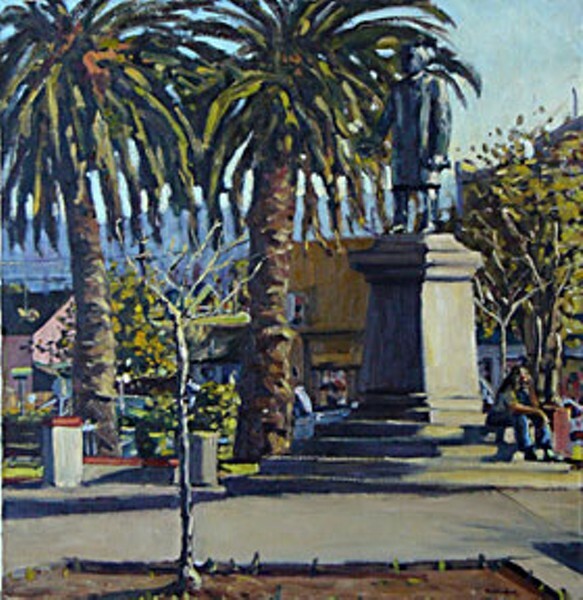 The steps around the statue of McKinley, featured in "Arcata Plaza," have given way to flowerbeds, and an apartment building now blocks the view of Curtis Otto's house in "Eureka Street." Vegetation currently obscures the view of "Korbel Bridge," and "The Red Pepper," the Arcata restaurant Jim captured so luminously in 1980, disappeared decades ago. Two of the artists featured in Jim's portrait series have since died. As he sold another painting featuring the Trinity River in 1985, Jim told the buyer, "Stock Schlueter was painting with me on the day I did that one. There had recently been a landslide and it created a big open spot in the composition that I thought was visually appealing." Vegetation has erased the slide over the years since, he noted, creating a completely different landscape. Over the next four days, the gallery remained full, a community of strangers united by shared memories of a distant time and place, evoked by Jim McVicker's images. 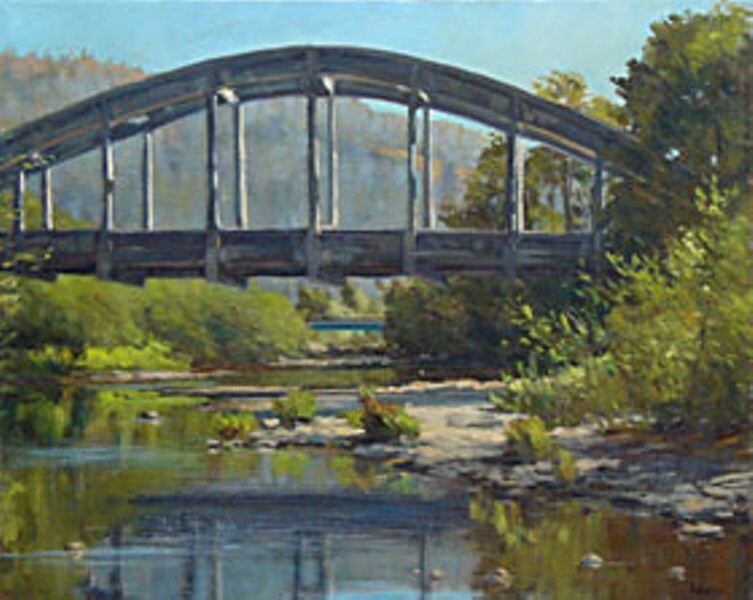 As a plein air painter, Jim's work has been very visible over the years, and many people remembered running into him while he painted in Trinidad or Loleta or Arcata. Everyone had stories. There was Sal, for instance, who worked at the bowling alley behind Jim's funky studio in Arcata in the early '80s. "I could hear the pins fall while I was sleeping," Jim recalled. "Sal came by the studio often and I did portraits of him and his wife, Gloria, which they still proudly own. Sal reminded me that Gloria did my hand print and a palm reading from it in 1981. She predicted I would become a very successful artist." In 1983, two years after that palm reading, Jim followed a girlfriend to Wyoming. "George and I had painted together daily for about three years, and it was a great period of growth," he said. "I spent the year in Wyoming finding more of my own voice." Jim broke up with the girlfriend and moved back to Humboldt in 1984. He met Terry the same year. "Her influence on my work and life started another period of growth that continues today," he said. "It's great to have another artist in my life who has her own vision, which in turn makes my work stronger." Terry remained on everyone's mind over the course of Jim's show, despite the whirlwind of chaos that defined the gallery. Further tests revealed Terry had compressed disks, a cracked vertebrae, fractures in the sacrum and a painfully inflamed psiatic nerve. She remained in the hospital and Jim remained sleepless. More than 70 paintings ultimately sold over next few days. The gallery ran out of red dots, the price lists kept disappearing, and the bank handling the gallery's credit card account called to ask what in the world was going on. There was an outpouring of love and support for Terry, as well. Her spirits remain remarkably high. Her doctors predict a long but complete recovery. Many of the paintings from Jim's show, treasures of a bygone era, now grace the homes of new owners, and both Terry and Jim are focused on the future. "We've already talked about how Terry's accident will impact our work, how it will change what we're painting," Jim mused. "We aren't sure how that will play out yet, but we're optimistic about what the future holds." If you'd like more informationabout Jim's show or Terry's condition, please feel free to call Bill Cody at the gallery at 444-3995.